The United States Congress designated the Blackjack Springs Wilderness (map) in 1978 and it now has a total of 5,912 acres. All of this wilderness is located in Wisconsin and is managed by the Forest Service. 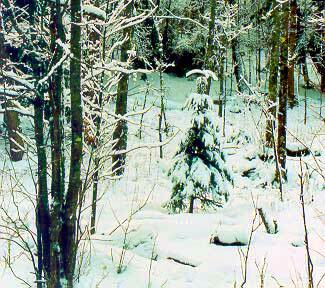 The Blackjack Springs Wilderness was established by Congress in 1978 and is located in Northeast Wisconsin on the Eagle River Ranger District of the Chequamegon-Nicolet National Forest. Much of the area was changed by logging and fire in the early 1900's with subsequent reforestation, road building, and timber harvest under National Forest management. Portions of abandoned logging roads and railroad grades are still visible. In the midst of the wilderness, four large crystal-clear springs, for which the wilderness is named, form the headwaters of Blackjack Creek. Here, glaciation from the last ice age has produced a rolling and uneven terrain. In the northeastern section of the wilderness, you will find the delightfully named Whispering Lake, surrounded by forest that provides habitat for black bears, deer, fishers, ruffed grouse, and a variety of sweet-throated songbirds. Three streams drain the area, and produce occasional ponds and wetlands. Much of the use of the Wilderness revolves around camping, hiking, fishing, bird watching, and hunting. Several trails enter the area, providing four miles of maintained trail, though many additional opportunities for hiking also are provided on the abandoned road grades still evident in the area. Planning to Visit the Blackjack Springs Wilderness? How to follow the seven standard Leave No Trace principles differs in different parts of the country (desert vs. Rocky Mountains). Click on any of the principles listed below to learn more about how they apply in the Blackjack Springs Wilderness.